On January 26, 1998, Ford Motor Company announced it would end production of the Lincoln Mark VIII in June 1998, leaving the Cadillac Eldorado as the only traditional American luxury coupe left on the market. Mark VIII sales were doing poorly. Only 16,805 of the newly revamped 1997 models were sold, and sales of the 1998 were even lower. 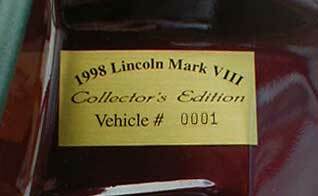 On February 5, 1998, Lincoln announced that it would offer a Mark VIII Collector's Edition, a special commemorative version of the car. In Lincolns published announcement, Jim O'Connor, Ford vice president and general manager of Lincoln Mercury states, "We're celebrating the major role the Mark series has played in Lincoln's history. These are the cars that ushered in the Mark traditions of the Lincoln grille, bold C-pillar, long hood and short trunk, including the famous Continental kit spare tire." Lincoln had offered special editions when it has discontinued a line of cars before. In 1979, a Collector's Series option, was offered on the last of the Mark V's and the last of the big Town Cars. See this link at www.classiclincolns.com for more information on these special cars from 1979.. 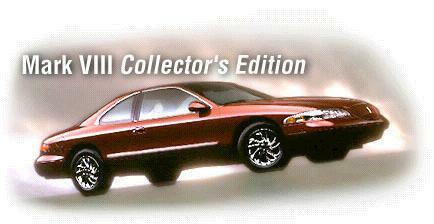 The Collector's Edition was a $900 option on top of the base price of the LSC edition of the Mark VIII on which they were all based. Only two colors were offered: the Cordovan Metallic color, which was exclusive to the Collector's Edition in 1998, and a $365 extra cost White Pearlescent Tri-coat Metallic. 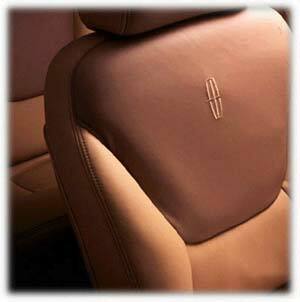 Two special interiors were offered a two tone Graphite interior and a two tone Prairie tan interior. Interesting, though all other LSC's featured Euro-perforated interior, the Collectors editions hides were solid with no micro holes in the seating area. Possibly, the seating materials were made up early in the decision making process when the Collector's Edition was planned to be a base model. Unique Badging. 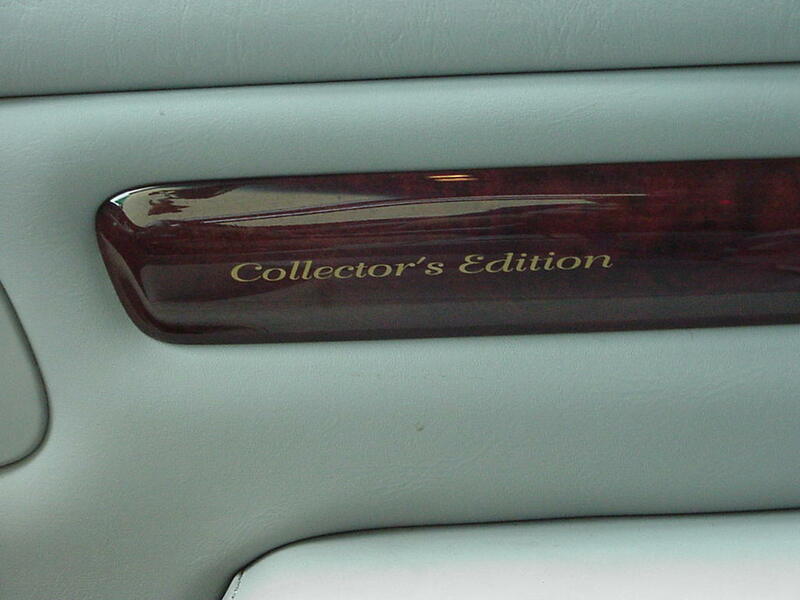 Collector's Edition was spelled out in gold on an inset in the unique body side molding and in delicate gold leaf on the wood door insets. The grill emblem was gold plated as was all the lettering on the taillight lens. Black plastic continental stars were inset onto the standard chrome LSC wheel center caps. Wood Trim. The Collector's Edition got a special leather steering wheel with genuine walnut inserts. This steering wheel is reportedly, the same one used in the new Jaguar. 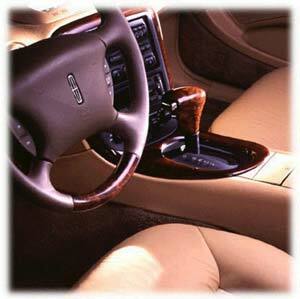 Instead of a leather covered shift lever, the shift lever is polished wood. All the wood inserts in the Collector's Edition is of a higher gloss finish than on the standard LSC models. Collector's Gift. 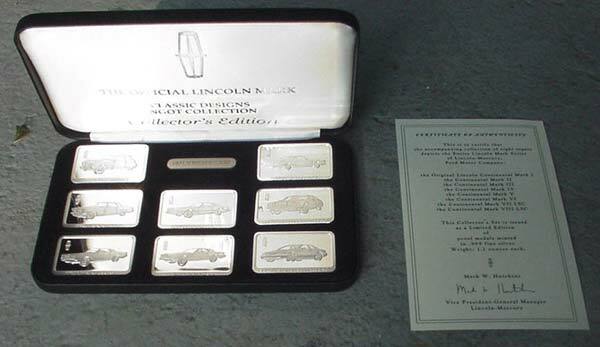 After delivery, Collector's Edition owners were sent a black leather case containing an eight silver ingot set commemorating the Mark line from the original Mark I, the 1939 Lincoln Continental, to the present last Mark VIII series. Each set was personalized with the VIN number of the owner's car. Each set was accompanied by a note from Lincoln-Mercury vice-president/general manager Mark W. Hutchinson.Interestingly, there is no acknowledgment of the Mark III, IV and V made in 1958, 1959 and 1960 respectively. Ford has consistently ignored these three years of Marks in all its announcements and literature about the Mark VIII. Apparently when the 1968 Mark III was planned, Ford wanted to wipe clean the history of the Mark after the memorable Mark II of 1956-57. Unique Floor Mats. The floor mats were color keyed to the interior and have "Collector's Edition" script stitched into them, instead of the usual "LSC" or "Mark VIII." Floor mats were only available for the front. Black Door Latches. This was never mentioned in any announcements or literature. Instead of chrome door latches as on all the other Mark VIII's the door latches were painted black. Possibly this was a cost cutting measure by Ford, as was the deletion of the plastic generator cover in 1998 that was standard in 1997. Orders for the Collector's Edition were taken starting in April of 1998. All the cars were built in the weeks from June 8 to June 27, 1998. Each car received a metallic gold sticker with a serial number on the driver's door jamb. These serial numbers are not consecutive with production, as they were randomly applied to the cars, after they were all assembled. Serial numbers are known to go up to 1280, with this last car going to the Dearborn museum. Ford's records indicate that 1386 Collector's Editons were built. The additional cars may have been made for Canada and other countries. Special brochures were printed for these cars. The intial brochure had a cover with a closeup of the taillight lens with gold letters "Mark VIII Collector's Edition." The production car did not have this detail, so a second brochure was made with a cover showing a small picture of a Collector's Edition in Cordovan Metallic. Both of these brochures are exceedingly rare. Reportedly, only one copy of the second version was given to each dealership. Click on the link on the bottom to see pictures of the brochures.